For those of you who only know the current food options on the Coral Gables campus, it’s time for a mini-history lesson. For those of you who’ve seen the changes take place, here’s a trip down memory lane. But before the university’s Dining Master Plan was completed, the food landscape on campus was quite different. Forget everything you know about the current dining situation as I map out where you could grab a bite pre-2015. First up, the food court. Seems like an obvious place to start, being the food center of campus. This is where the most changes occurred, as you’ll see. For starters, it was significantly smaller. The look and feel of the place was much more 1990’s, with its tile flooring and curvy wall pieces, than the current iteration (and yes, I was born in 1993 so I actually personally remember the 90’s). Like the current court, the old one was home to several chains. Wendy’s and Jamba Juice were right next to each other. Not far away was the rarely-frequented Red Mango frozen yogurt cart. A common theme of the food option transformation was the replacement of one-off institutions with big chains. All post-2015ers, ever heard of Mango Manny’s, Niko’s, Salsaritas, or Market Square? I don’t think I’ve ever spotted one outside of the old-trusty court. I know that’s also why it took me a while before I was willing to try Mango Manny’s. It’s in the same vain as Pollo Tropical but with a much homier feel to it. Ready for this? I’m going to run through my order of choice at each place to try to take your taste buds with me on this time machine. Mango Manny’s offered a good chop chop, full with grilled chicken, black beans, rice, and incomplete of course without several sides of curry dressing. Niko’s had above-average sandwiches. I would always get turkey and provolone, but it was the focaccia, roasted peppers and onions, and spring mix that really made the sandwich. Salsarita’s was hands down my go to. The campus Mexican-option was exactly what a NorCal boy like myself needed to remind me of home, and the chicken tacos were simple and simply did the job. For all of those times my mom guilted me into eating more salads, the salad bar of Market Square was there for me. A 50/50 combo of romaine and spring mix was the perfect bed for my excessive use of balsamic vinaigrette. The tortilla chips and carrot shreds added a satisfying crunch to boot. The aforementioned options, plus Panda Express, rounded out the old food court eateries. Subway, currently in the new food court, used to be in the storefront by the law school where Einstein Bros. is now. 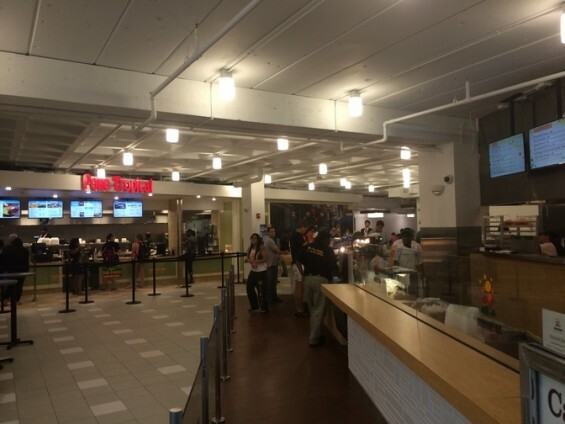 A look inside the new food court at the University of Miami (CNN). 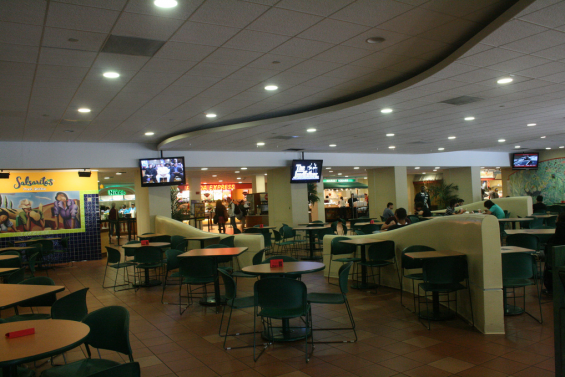 Some of the current food court options are chains you can find outside of campus, like Pollo Tropical and Panda Express. Having these sounded like a plus at first, until I realized that I could get these options outside of campus. Translation: the old options were unique because you weren’t going to be able to get them anywhere else. Changes were being made even before the food court facelift was underway. The Shalala Student Center was under construction when I first came to campus in Fall 2012 and wasn’t opened until the Fall 2013 semester. Scratch off those current food options, including Fresh Fusion and (another) Starbucks, from the pre-2015 list (Jamba Juice moved from the food court to the Student Center). But I digress. The university once operated a pizza truck, Uragano, that posted up by the Rock a few times a week. That pizza reliably gave me heartburn every time I ate it. You know that rarely used “Storm Surge” room? Right across from the swimming pool entrance in the University Center hallway? Don’t worry, I only know of it because I tried to go there once when it was too late. There was a deli there at one point. Oasis was its name, and they were the Kosher option on campus, serving up soups and sandwiches along with some other simple breakfast options. My lasting impression of Oasis was the place I always wanted to go to during a Jewish holiday, but was always closed for that very same Jewish holiday. Last but not least, the C-store (campus convenience store) was where the new Office of Admissions is situated. Now, Outtakes (the C-store replacement) is part of the new food court and houses UM’s new kosher option, The Corner Deli. I suppose the two are adequate replacements, if for no other reason than they’re both in a renovated venue. Except the guy at Corner Deli took 15 minutes to make the guy in line in front of me a sandwich…so there’s that. The first casualty of the new food court was Built, a burger joint that was replaced by Burger 305 prior to the Fall 2016 semester. And that about does it. For my pre-2015ers, which setup do you prefer? I’m still undecided myself. One thing remains. If I’m hungry, I know I can eat. Alex Goldman is a senior majoring in journalism with a minor in political science. He is currently the Sports Editor of distractionmagazine.com. He’s a Northern California native and loves snowboarding, writing, and above all the Green Bay Packers.